St Mary’s Inn is the second venture of Jesmond Dene House, and is a pub and B&B in a private housing estate near Stannington village. Although some people have suggested it’s location is a little difficult to find, we had no trouble at all, as it was only a short distance away after turning off the A1. As we drove up to the inn, I was taken away by the beauty of the red brick building. 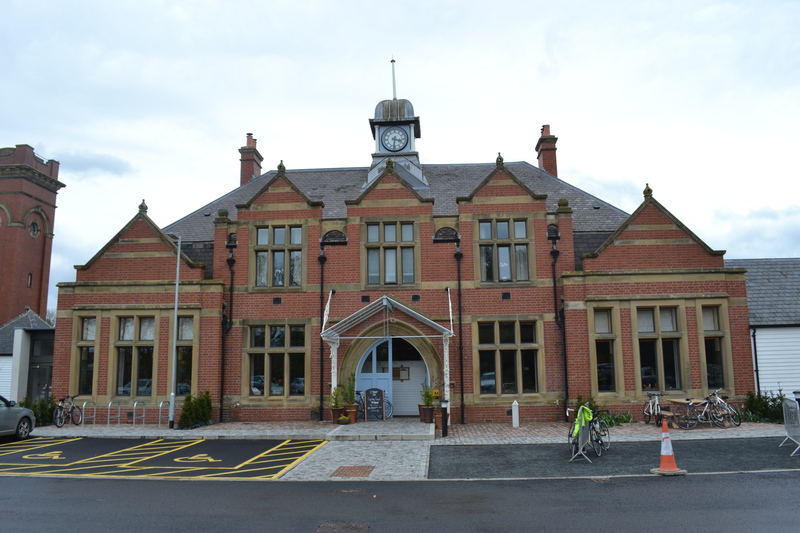 It used to be the former administration building for St Mary’s Hospital, and I’m impressed that someone stumbled across it and thought it would make an excellent B&B venue. The day we chose to visit for afternoon tea was also the day of the first St Mary’s Bike Ride, so the car park and entrance to the inn was full of cyclists getting ready to bike away (the picture above is when we left)! 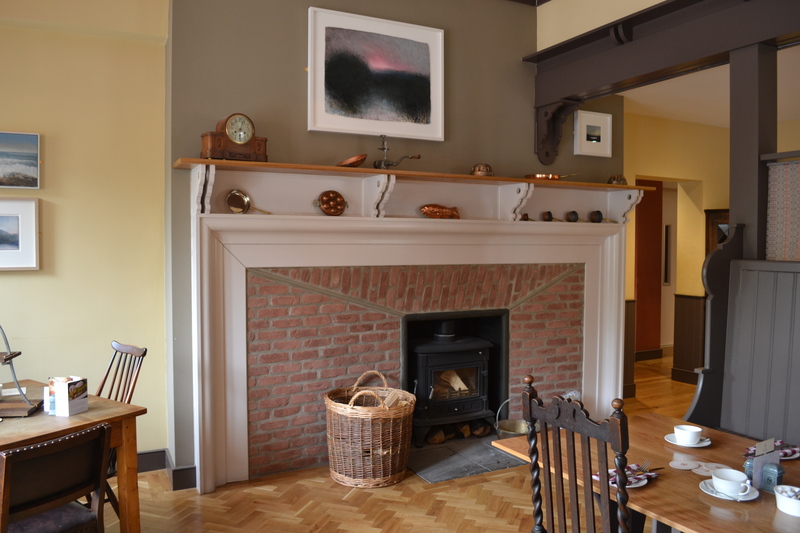 Inside, the interior is decorated in a modern, country-style with natural shades and beautiful wooden floors, and divided into small dining areas, so anywhere you sit feels intimate and cosy. 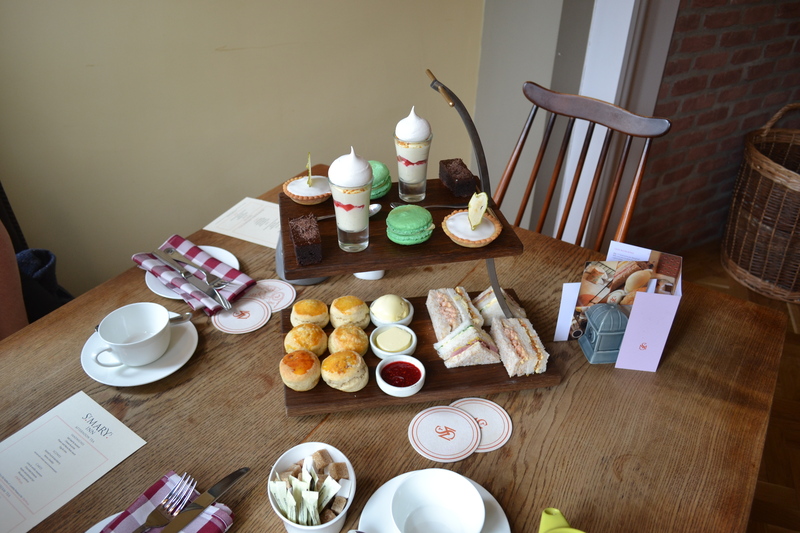 We were immediately shown to our seats by a very polite waiter, and given a menu which explained our afternoon tea. Our waiter then asked what tea we’d like. We asked for the options, and he reeled a long list off. 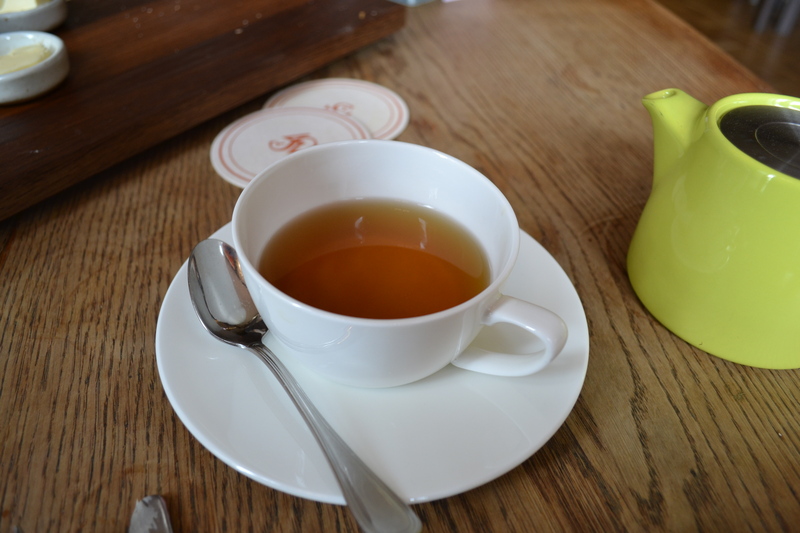 I was excited with all the choices, but finally chose peppermint tea, while Christine chose Darjeeling tea. 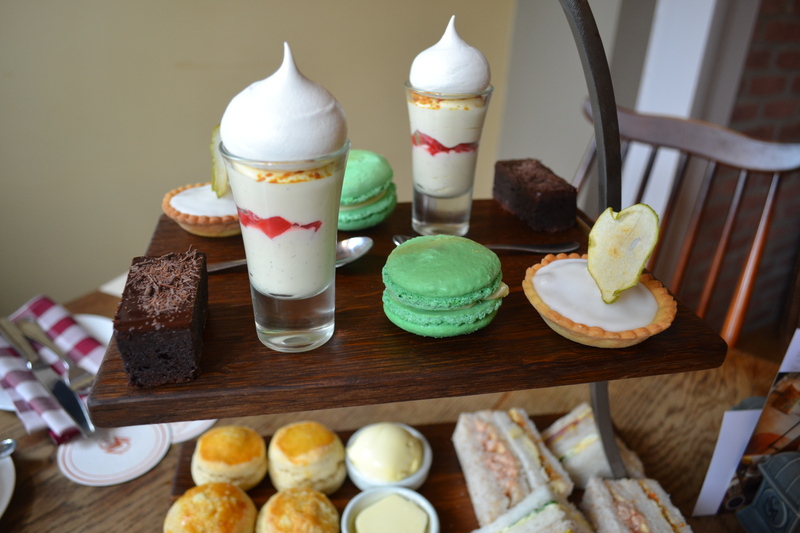 We didn’t have to wait long for our afternoon tea to arrive, and it looked so beautiful when it did. It was displayed on a wooden two-tier stand which I thought was quite modern, and in-keeping with the theme of the inn. 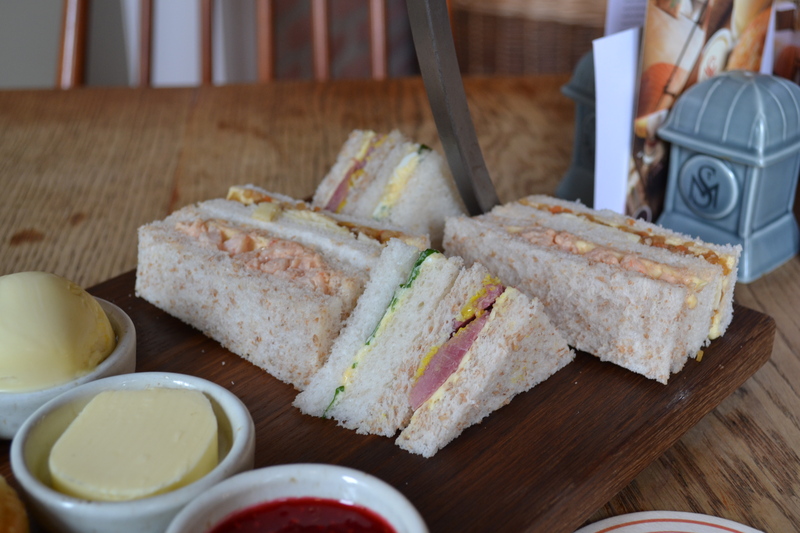 Our sandwiches included: salt beef and mustard, cheese and pickle, prawn and Marie Rose sauce, and egg and cress. They were perfectly made and presented, crustless and with strong flavours. I really liked the salt beef and mustard sandwich. 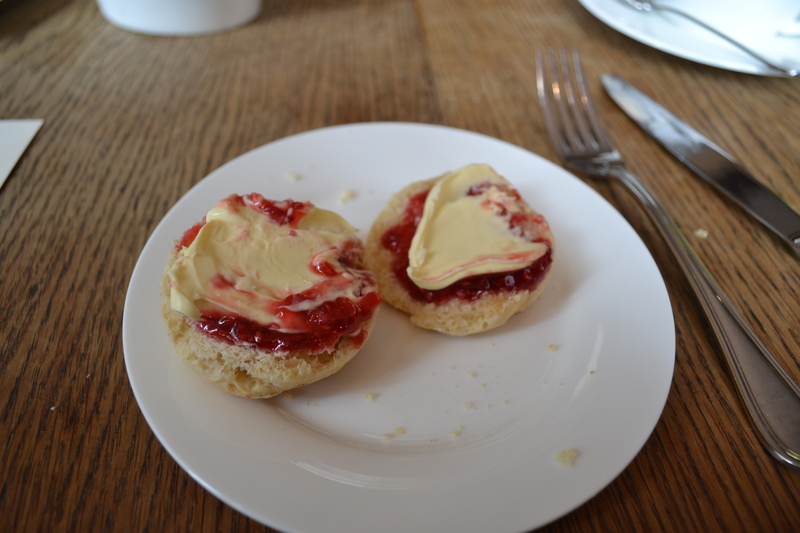 We also had three miniature scones of plain, fruit and cheese which were served with butter, clotted cream and jam. I must admit, despite their small appearance, by the time we had gotten to the third scone, we needed a bit of a rest, and decided we’d save it for last and try the desserts before we were too full! 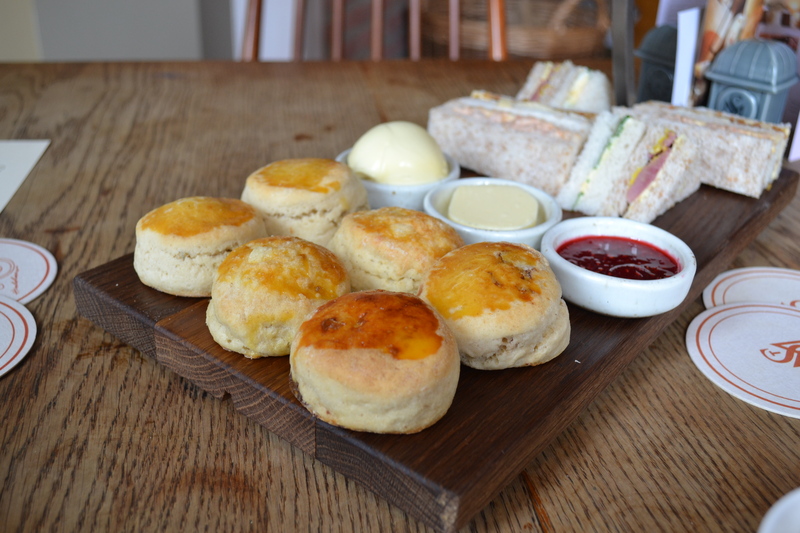 Afternoon tea always looks so dainty, but it really does fill you up! Our waiter was attentive, checking back on us every now and then to ensure we had enough tea and we were happy with our food, without hovering or intruding. Exactly the kind of service you want! On to the cakes! 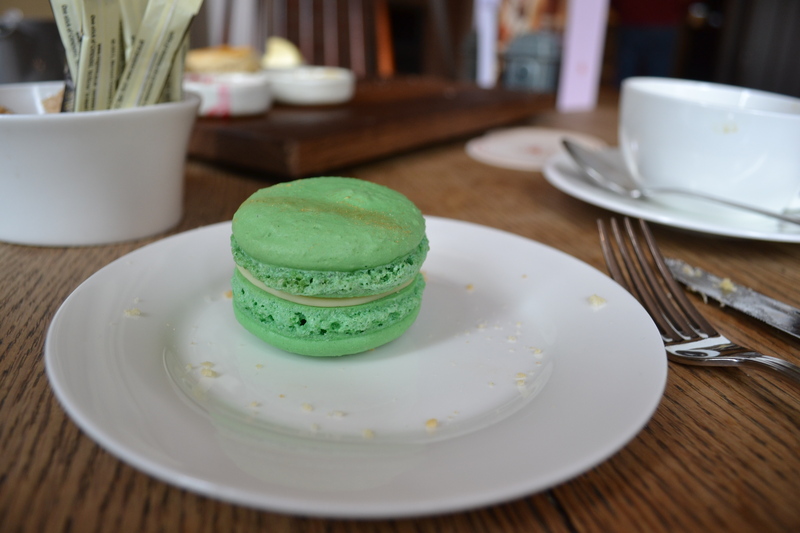 First up was the lime and vanilla macaroon. Now, readers, I’ll let you in on a little secret…. until this moment, I’d never had a macaroon before. Can you believe it? I always thought they looked artificial in colouring and would just be one massive sugar rush and a bit of a taste disappointment, but now I take all my words back as this little macaroon was amazing! It was delicate and light and so mouth-wateringly good. Why have I been missing out on these tasty little treats? I was very impressed. I also loved the apple and almond tart, a twist on a bakewell classic that was done extremely well, with a thin apple crisp in the top. The brownie was chocolately and fudgy as it should be, but definitely pushed us over the edge of feeling too full! However, it was just at this moment that our waiter returned and asked if we’d like some more tea. We happily took him up on his offer, and spent the next ten minutes sipping tea and chatting before we felt ready to carry on eating! The rhubarb pavlova was light and refreshing, and we loved the little meringue on top. We then returned to our scones, and nearly managed to finish them all. Alas, a half of a scone remained for the both of us. For £14.95 per person, I think the afternoon tea at St Mary’s Inn is fantastic value for money, especially since there are a lot of places who do it (and nowhere near as well) for £20 a head. Before leaving, we asked if we could have a quick peep in one of the bedrooms (cheeky I know, but we really wanted to see what they looked like!) A waitress kindly agreed and showed us one of the rooms. It was plain, with colour accents and I loved it. 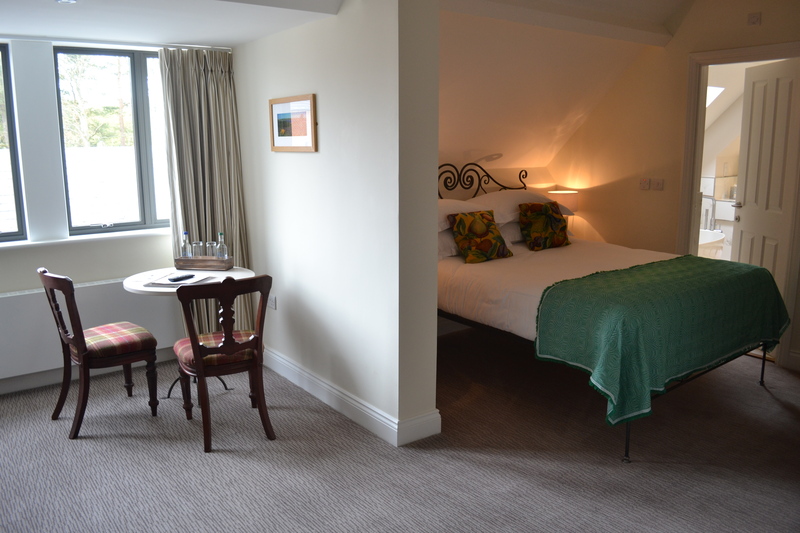 The rooms even share their own terrace which will be a suntrap in the summer months and you couldn’t hear any of the noise from the pub below. On our way out, my friend Christine was impressed to find three compost bins, where all the kitchen waste was put to be turned into compost. A brilliant idea, and environmentally friendly too. 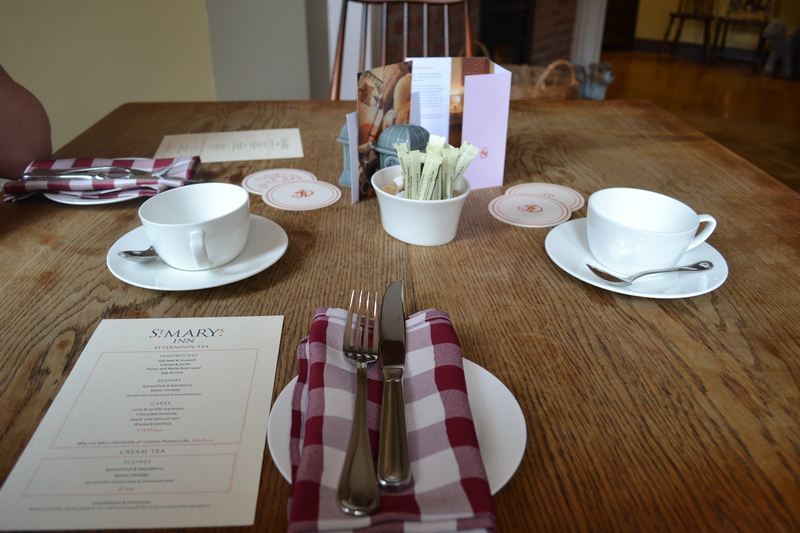 We loved everything about St Mary’s Inn, and I definitely want to return soon for dinner. The menu looks so good! 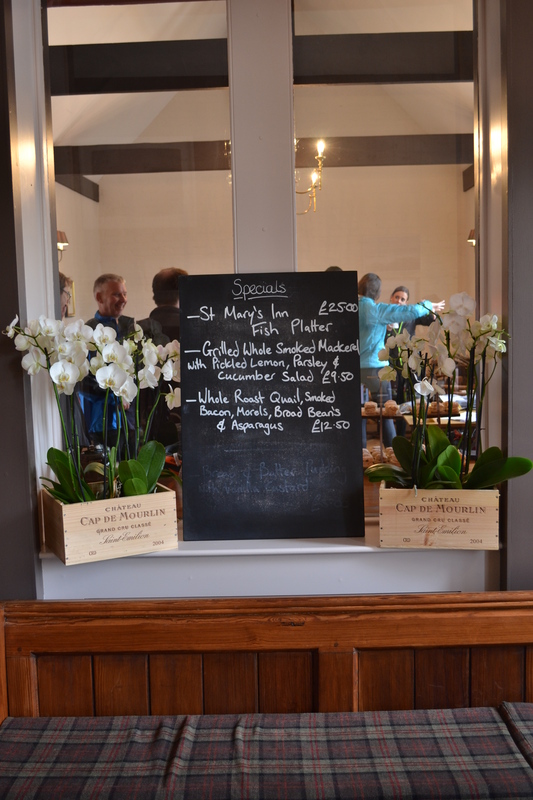 Have you been to St Mary’s Inn before? What did you think? I’ve been for dinner in the evening but I definitely want to head back for afternoon tea, especially given how much we love the afternoon tea at Jesmond Dene House. We have a “staycation” in July so we’re seriously considering popping to St Mary’s Inn for afternoon tea during that week, Simon’s a bit jealous that I’ve been for a nose round and he hasn’t!